Two distinctive art forms came together for a brief period in Germany during the tenth and eleventh centuries, the period of Ottonian and Salian rule. In keeping with the theme of the symposium’s title, “Silk Roads, Other Roads,” the medieval roads that this essay will travel converge in a number of ways. Most importantly, two distinctive art forms came together for a brief period in Germany during the tenth and eleventh centuries, the period of Ottonian and Salian rule. The two products, silk and illuminated manuscripts shared important qualities. Not only were they among the most luxurious objects of the middle ages, but they also assisted bishops and rulers advance their political programs. 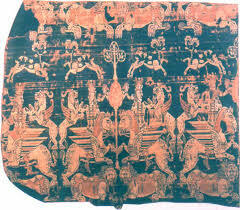 This phenomenon developed as a result of increased interaction with a major source of the silk, the Byzantine world. Once the silk reached the West it became an integral part of gift exchanges between secular and ecclesiastical leaders and played a role in the burgeoning liturgical pageantry of the period. A unique creation resulted from this intersection of art forms. From the mid tenth century until about 1040 manuscript artists painted ornamental pages in their books inspired by the precious woven fabric. Figure 1. Silk covering of the relics of St. Hippolytus, 9th century, unknown origin, Cologne: Church of St. Ursula. Examining the art forms separately, documentary evidence from the early middle ages reveals that silk played a multivalent role in Germany in the tenth and eleventh centuries. The fabric made its way to Western Europe through diplomatic gifts from Byzantium, through trade and by smuggling. From the sixth century on the papacy was a particularly fortunate recipient of the costly material, as is evidenced by descriptions of diplomatic gifts in the Liber Pontificalis, a semi-official biography of the early popes. This source places great emphasis on the value of the gold and silver gifts they received but the detailed descriptions of silk indicate the great esteem the popes held for it. In their original context, many of these silks were used to wrap the most precious objects belonging to a church, a saint’s relic. We are fortunate to have large repositories of silk fragments of various sizes in museums and cathedral treasuries all over Europe, most originating from the Byzantine and Islamic worlds. Two surviving wrapping fabrics illustrate this point. From the tenth century, a large piece of silk twill associated with the relics of St. Abundius originated in Eastern Persia. This work contains repeating rows of medallions, filled with animals, one of the most common decorative styles in Byzantine silk weaving. Each medallion is woven in a color that contrasts with the background. An especially lively work produced in the 9th century traveled to Rome where it was used to wrap the relics of St. Hippolytus. The relics and the fabric were translated to Gerresheim later in that century, then moved again to St. Ursula’s in Cologne in 922 where they remain today. (Fig. 1) Their portability enabled more than just a few people to see them. Relics held a prominent place in medieval society in this period, and the demand for them in Northern Europe was great. They quickly became part of the liturgy of the mass by means of display in the worship service or by being part of a procession. The idea of silk concealing and protecting highly cherished and important objects applies to vestments and metaphorically to manuscripts. Less common, but still surviving in significant numbers are silken liturgical and royal vestments. The shimmering quality of the silk made the celebrants of a mass resplendent as light glinted off the fabric when they moved through the church. Like the silk-wrapped relics, these luxury objects cloaked important people – bishops, kings and popes. When these men enveloped themselves in the sumptuous fabrics they entered into active participation in the pageantry of the liturgy, and elevated their status to something analogous to royalty. The garments they wore were outward signs of their prerogative to rule over their respective sees. Furthermore, ecclesiastical reforms originating from the monasteries at Cluny and Gorze took place in the tenth century and spread throughout the German territory that directly impacted liturgy and even liturgical vestments. Figure 2. Chasuble of Archbishop Willigis of Mainz, silk, 10th century, Munich: Bayerische Nationalmuseum Inv. Nr. 11/170. Two examples associated with important early Ottonian bishops are germane to the discussion because of their patterning and iconography. Many of the surviving vestments are closely related to each other in terms of weaving technique and size. One of the chasubles associated with Archbishop Willigis of Mainz is quite large measuring 520 cm at the hem. (Fig. 2) It is a yellow samite woven in the twill technique in a monochromatic style called the “cut style,” meaning that its design appears to be engraved. Hardly a square inch of the piece is devoid of ornament, which is made up of complex patterns of pointed ovals, rosettes, circles and climbing vegetal decoration. Filling the surface with ornament was a hallmark of Byzantine silk weaving. Figure 3. Chasuble of Bishop St. Ulrich of Augsburg, silk 10th century, Augsburg: Katholische Kirchenstiftung St. Ulrich und Afra. The chasuble of bishop Ulrich of Augsburg has a particularly interesting design. (Fig. 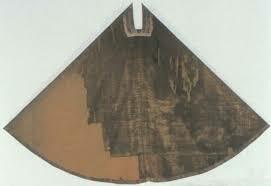 3) It is a green samite woven in the twill technique measuring 500 cm at the hem. What makes this work unique are the medallions of imperial figures woven into the fabric. These figures represent crowned Byzantine emperors with haloes around their heads. It is unlikely that Ulrich personally chose this fabric as a reflection of his political aspirations, though he ruled as bishop for 50 years. He probably received it as a gift from the emperor, who had received it from a Byzantine or papal ambassador. Figure 4. Star mantle of Henry II, silk with gold and silver embroidery, early 11th century, Bamberg: Diözesanmuseum. An imperial example of ceremonial vestment is the famous mantle given to Henry II around the time of his ascension to the imperial throne in 1014. (Fig. 4) Henry’s mantle is an exceptional work of art that symbolically imbues the emperor with powers on a cosmic level. When donned, the imperial head appeared above a field of stars and constellations embroidered with gold and silver silk threads on a deep rich blue ground. This mantles was a tangible symbols of the sacral nature of the imperium, continuing a tradition started by the first Ottonian emperor, Otto the I – the Great. The role of the ruler as rex et sacerdos (king and priest) was played out quite effectively in these remarkable vestments. From the very beginning of its existence, the illuminated manuscript containing biblical or liturgical texts embellished the word of G-d through the decoration of the letters and words themselves. Furthermore, artists painted ornamental and figural pages adding sumptuous and often symbolic qualities to their texts. Ottonian artists in particular developed an interest in patterns and their repetition at this time. [LEFT]: Figure 5. Marriage Contract of Emperor Otto II and Theophanu, dated 14 April 972, Wolfenbüttel, Niedersächsisches Staatsarchiv 6 Urk 11. [RIGHT]: Figure 6. Detail of Marriage contract. The meeting of silk and manuscripts was the direct result of the convergence of two political roads – the Byzantine Empire and the nascent Holy Roman Empire. One of our earliest examples of the fusion of these two art forms is in fact not a manuscript but a ceremonial legal document. On April 14, 972, a momentous wedding took place at St. Peters in Rome between Otto II, co-emperor in the West and Theophanu, an obscure Byzantine princess. In honor of the marriage, Otto I commissioned a lavishly decorated contract. (Figs. 5-6) The work takes the form of a scroll and consists of three sheets of parchment stitched together, measuring 144.5 cm x 35.5 cm. The parchment is dyed a fairly uniform shade of red. The other dominant color used, a deep shade of bluishpurple, was applied over the lighter shade of red, establishing a rich contrast. The overall composition imitates other art forms, but the most striking features are the bright red compass-drawn pearl-style medallions. Precisely drawn in ink, they contain alternating pairs of symmetrically arranged animals engaged in combat. A jewel-collared griffin attacks a smaller animal that looks like a lamb, and a lion attacks a cow in alternating rows of medallions. To each side of and between the medallions are alternating heart-shaped and cross-shaped vegetal motifs, or variations of rosettes rendered in red in a reserve technique. On top of the decoration are 62 lines of legible text written in gold, which in addition to extolling the virtues of the co-emperors Otto, and justifying the marriage itself, explicitly bestows upon Theophanu lands on the Italian peninsula and in several regions north of the Alps. The medallions present the strongest visual correspondence to Byzantine art and silk weaving in particular. With their repeating and symmetrical compositions, they display the key characteristics that would be copied in contemporary and future Western manuscripts. It embodies the Byzantine artistic convention that ornament should cover a surface in order to increase its visual splendor through a richness of pattern. Textiles displayed this principle most strongly. Western manuscript painters of the tenth and eleventh centuries also believed in the abundance of ornament on the painted page. Consequently, very little white space remains on the parchments. Figure 7. Egyptian roundel, linen and wool, 6th – 8th centuryWashington, DC: Dumbarton Oaks, Byzantine Collection Inv. No. 46.17. The fighting animal motif originated in the ancient Assyrian Empire, and continued to be a royal symbol of power well into the Sasanian period and possibly beyond. An example of an Egyptian woven roundel made of wool and linen dating to the seventh or eighth century adorned prominent parts of garments of wealthy patrons. (Fig. 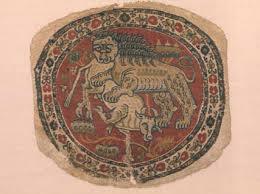 7) This motif made a resurgence in Byzantium in silk weaving in the seventh and eighth centuries and again in the tenth century during periods of increased contact with Islamic culture. From a Western standpoint, it is difficult to determine how much of the original symbolism of royal power remained intact. Obviously, two powerful forces have come together through the marriage. It is plausible that the German artist or patron of the contract intended to make a visual statement concerning Ottonian authority. Some people have commented that the animals being attacked are female, suggesting that Theophanu’s place in her new home would be subordinate to Otto. 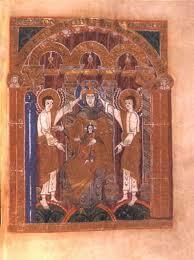 This work immediately went to the royal convent of Gandersheim and stayed there for centuries. During Theophanu’s lifetime, though, it was likely displayed, inspiring visiting artists with ideas to take back to their monasteries and workshops. Three centers of production are responsible for textile-inspired manuscript painting, Corvey, Hildesheim and Echternach. Each of the imperially endowed monasteries treated the source material differently. Approximately twenty manuscripts survive that are painted with some type of textile-derived ornament. [LEFT]: Figure 8. Manuscripts and Archives Division, The New York Public Library, Astor, Lenox and Tilden Foundations, p.189. [RIGHT]: Figure 9. New York: Pierpont Morgan Library, Ms. M 755, fol. 100r. The Corvey manuscripts utilize textile-inspired patterns to set special textual passages apart from the rest of the manuscript. Two examples reveal a loose affinity to textiles with abstracted patterned backgrounds painted behind gold text. A lectionary dated to the mid-tenth century contains several painted pages under gold script from which the important feast day lections were read. For example, the lection after Easter week is placed in front of semi-circles and a circle articulated with stylized acanthus-leaf design. (Fig. 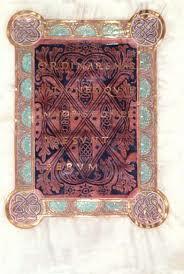 8) Another example comes from a Gospel book also dated to the midtenth century. (Fig. 9) In a similar fashion, this page uses a boldly contrasting leafy patterned background to set off introductory text to a Gospel. [LEFT]: Figure 10. Hildesheim: Cathedral Treasury Ms. 18, fol. 19r. [RIGHT]: Figure 11. Hildesheim: Cathedral Treasury Ms. 18, fol. 175v. From Hildesheim, the manuscript known as Bernward’s precious Gospel book dated to circa 1015 contains twenty-one full-page miniatures covered with textile inspired ornament. The artist placed some figures in front of patterned drapery as in the miniature of Matthew (Fig. 10) and others in front of flat patterns such as stripes, starbursts and chevrons as in the example of John under the Ascension of Christ. (Fig.11) These pages are perfect examples of the Western artist following the Byzantine convention of completely filling a space with ornament in order present the viewer utmost in lavishness in the work. [LEFT]: Figure 12. Hildesheim: Cathedral Treasury Ms. 18, fol. 16v. [RIGHT]: Figure 13. Hildesheim: Cathedral Treasury Ms. 18, fol. 17r. The dedication opening of Bernward’s Gospel book reveals a connection to the enhancements in liturgy developed a few decades earlier. (Figs. 12 – 13) In this opening, the Virgin Mary, Christ child and angels are placed in a golden architectural setting in front of purple drapes. Purple, of course, is a color long-associated with royalty, and the educated viewer easily understands the importance of these figures. Bernward, on the other hand, is a little subtler. In his portrait he, too, stands in a golden architectural setting, but the background is not painted to represent curtains. It is a flat, green-and-black ornamented surface that resembles the design of his chasuble. Through this patterning, Bernward symbolically places himself in a church setting in the immediate presence of the Virgin Mary, the Christ child and angels. Furthermore, the green striped cloth that lays across the top of the altar also resembles Bernward’s vestment, which metaphorically elevates him into the realm of the holy, just like the figures to whom he presents his book. 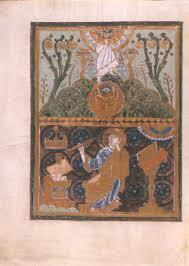 Six manuscripts made at Echternach, a royally endowed monastery, survive that contain fully painted ornamental pages. 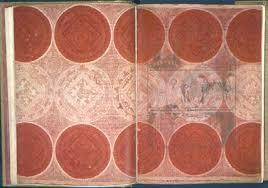 The bookmakers experimented with the placement of the patterned pages of these large-scale luxury codices. 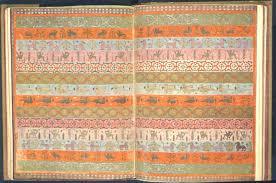 In a few cases the textile-inspired pages served as flyleaves at the beginning and ends of the books. In others they accompanied important figural miniatures, while one of the Echternach manuscript contains patterned ornament painted over a purple border framing figural miniatures. The ornament was not consistent from codex to codex, and in more than one example, the artist did not complete the project indicated by a number of blank borders and pages toward the ends of the manuscripts. [LEFT]: Figure 14. Nuremberg, Germanisches Nationalmuseum, Ms. HS 1516142, fol. 17v-18r. [RIGHT]: Figure 15. 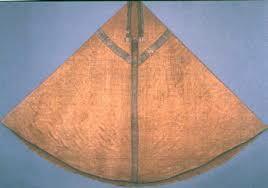 Silk Shroud of St. Siviard, 10th century, Sens, Cathedral Treasury, Photo: Anna Muthesius. One manuscript stands at the pinnacle of the Echternach productions. 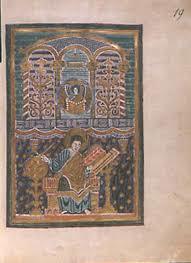 The Codex Aureus Epternacensis in Nuremberg, a Gospel book dated to around 1030 contains the most textile-inspired pages of any manuscript and is a real codicological achievement. A wide variety of designs painted on openings between each Gospel text analogically wraps and protects the sacred text much the same way that silk fabric protects relics and silk vestments cloaked bishops and kings. 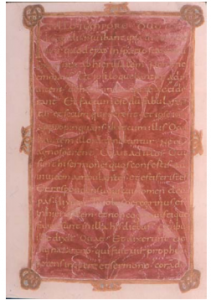 For example, in comparing a tenth century silk fragment associated with the relics of St. Siviard, a seventh century bishop, with the opening that divides the Gospels of Matthew and Mark, a comparison to the cut style in silk weaving is evident. (Figs. 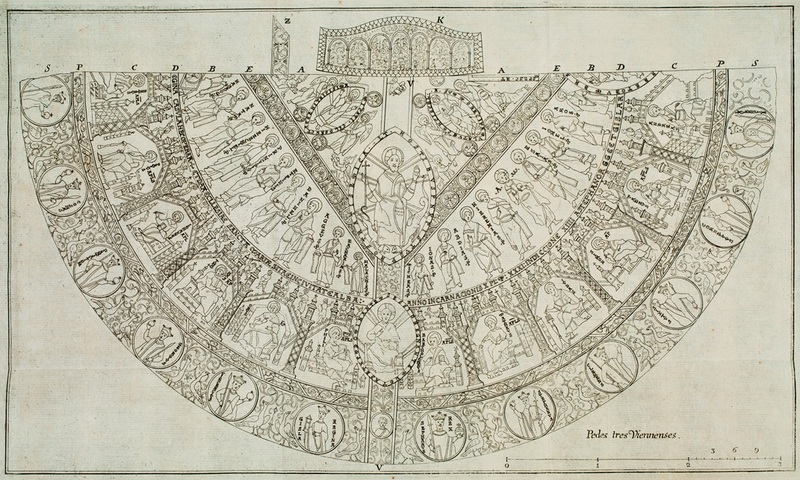 14 – 15) The manuscript page is mostly monochromatic and contains medallions filled with birds articulated with curvilinear elements and vegetal motifs inscribed in the center of a series of large medallions. Figure 16. Nuremberg, Germanisches Nationalmuseum, MS HS 156142, fol. 51v-52r. An especially colorful opening dividing the Gospels of Matthew and Mark utilizes almost every pattern woven into textiles during this period. Griffins, birds, trees, starbursts, florettes and, of course, medallions are arranged symmetrically in rows, and the pattern repeats vertically as well as horizontally. (Fig. 16) Two striking features in this opening are the varieties of contrasting colors and the subject matter. 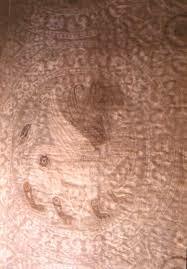 The different motifs set off strongly from the rich bright background much as they are in most silks from the period. In conclusion, examination of these magnificent pages from a liturgical standpoint is an important point to consider because liturgy was often visually oriented. An audience of worshippers witnessed processions in which luxuriously cloaked bishops or clerics carried cherished objects, including manuscripts and set them on an altar for all to see. These luxury manuscript pages may certainly be added to the evidence that the bishop patrons desired splendor in their most important resource – the manuscript. Where better to derive their inspiration than from silk? The artistically expressive union of silk and manuscript painting was, for a brief period in the middle ages, an exciting intertwining of politics and religion. 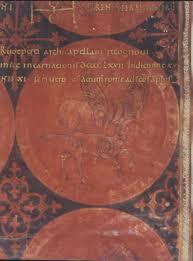 The Byzantine world was a driving force behind silk in Western Europe. Emissaries from both sides transported it to patrons and artists who made use of it in new and innovative ways. The duplication of patterns between fabric and page created a synergy connecting liturgy, politics and art that aesthetically joined two realms all too briefly. Lawrence Nees, Terri Nevins, Laura Cochrane, Isabelle Lachat, my colleagues at the University of Delaware, Dr. Pam Parmal of the Boston Museum of Fine Arts and Professor Marjorie Senechal of Smith College. 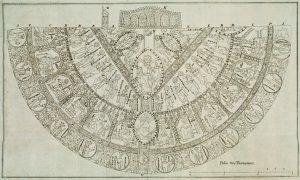 Wilckens, Die textilen Künste von der Spätantike bis um 1500 (Munich: Verlag C.H. Beck, 1991), 37-40. The Lives of the Eighth Century Popes (Liber Pontificalis), Translated Texts for Historians, vol. 13, trans. Raymond Davis (Liverpool: Liverpool Univ. Press, 1992). 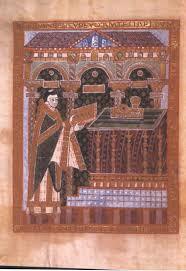 See also The Lives of the Ninth Century Popes (Liber Pontificalis), Translated Texts for Historians, vol. 20, trans. Raymond Davis (Liverpool: Liverpool Univ. Press, 1995). (Princeton, NJ: Princeton Univ. Press, 1990), 3-35. Cathedral treasury of Hildesheim, Inv. D 1997-4; height 92-94 cm width 111-112 cm. Unfortunately permission was not granted to reproduce this image. Cologne, Treasury of St. Ursula; height 60 cm, width 52 cm. (Basingtstoke, Hampshire, England: Palgrave, 2001), 95-136. Universitaires de Nancy, 1993), 193-212. The Romano-Germanic Pontifical was compiled at Mainz around 950. This document contains specific instructions on how to wear particular vestments for certain occasions. See Cyrille Vogel, Le Pontifical romanogermanique du dixième siècle, 3 vols, Studi e Testi 226-228 (Vatican City: Biblioteca Apostolica Vaticana, 1963). This chasuble is one of two associated with Willigis of Mainz. It is located in Munich at the Bavarian National Museum, inventory no. 11/170, height:165 cm. von Wilckens, Textilen Künste, cf. Note. 2:23. James Trilling, The Medallion Style: A Study in the Origins of Byzantine Taste (New York: Garland Publishing, 1985), 9. This chasuble is also one of two associated with St. Ulrich. It is located at the Katholische Kirchenstiftung St. Ulrich und Afra, height, 155 cm. Die Heiratsurkunde der Kaiserin Theophanu 14 April 972 Faksimile – Ausgabe nach dem Original in Niedersächsischen Staatsarchiv in Wolfenbüttel (6 Urk 11), ed. Dieter Matthes (Berlin: Verlag Müller und Schindler,1980). See also several essays in Kaiserin Theophanu: Begegnung des Ostens und Westens um die Wende des ersten Jahrtausends. Gedenkschrift des Kölner Schnütgen-Museums zum 1000. Todesjahr der Kaiserin, 2 vols, eds. Anton von Euw and Peter Schreiner (Cologne, 1991). Trilling, cf. Note 13, 9. Theophanu, eds. Anton von Euw and Peter Schreiner, 1991, vol. 2, 175-192. I wish to thank to Professor Patricia Warner of the University of Massachusetts at Amherst for clarification on this point. Wolfgang Georgi, “Ottonianum und Heiratsurkunde,” in Kaiserin Theophanu, eds. Anton von Euw and Peter Schreiner, 1991, vol. 2, 135ff. New York: New York Public Library, Ms. Astor 1: p. 189. This manuscript is not foliated in the manner of most other medieval manuscripts. See Vor dem Jahr 1000: Abendländische Buchkunst zur Zeit der Kaiserin Theophanu, ed. Anton von Euw (Cologne: Schnütgen Museum), 1991, 54-58. Bauer, Gerd. “Corvey oder Hildesheim? Zur ottonischen Buchmalerei in Norddeutschland,” Ph.D. Dissertation, University of Hamburg, 1977. NEED PP. This example is a page from Pierpont Morgan Library Ms M. 755, fol. 100r. Hildesheim Domschatz, Ms. 18. See also Das kostbare Evangeliar des Heiligen Bernward, ed. Michael Brandt (Munich, Prestel, 1993). London: British Library, Ms. Harley 2821. London: British Library, Ms Harley 2821 and El Escorial, Cod. Vitrinas 17. Aureus Epternacensis, Hs 156142 aus dem Germanischen Nationalmuseum Nürnberg eds. Rainer Kahsnitz and Elisabeth Rücker (Frankfurt am Main: S. Fischer Verlag, 1982). Sens Cathedral Treasury, 135 x 85 cm, Inv. T C B 8. 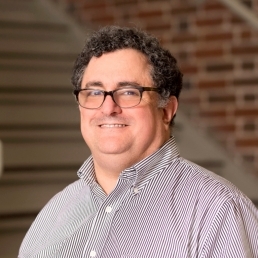 Originally published by University of Nebraska-Lincoln Digital Commons under free and open-access terms. This entry was posted in Art History, History, Medieval, Middle Ages, Ottonian. Bookmark the permalink.